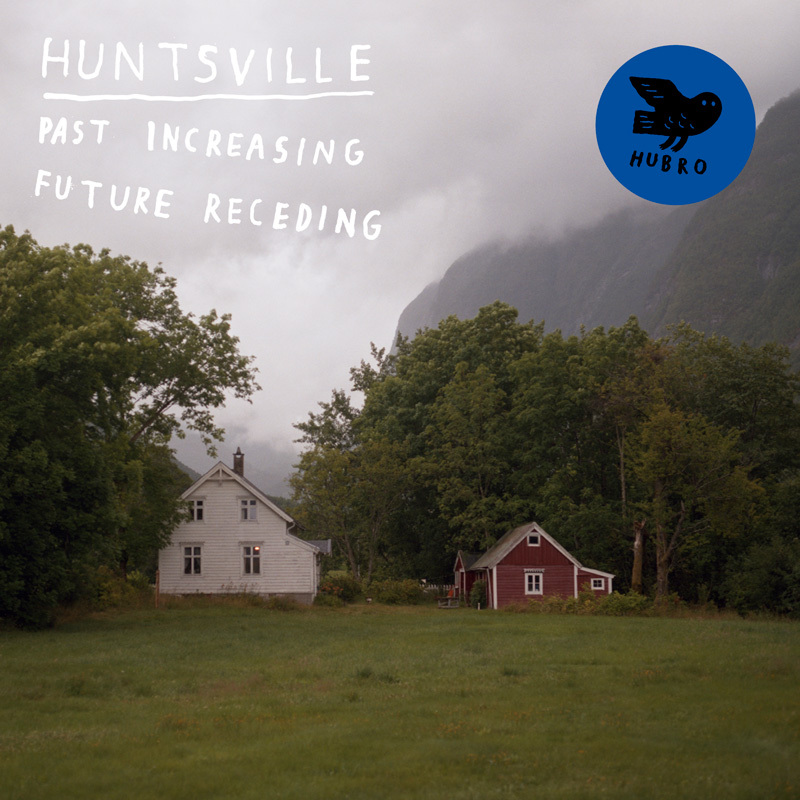 The distinctive trio Huntsville continues to impress us on its fourth album, “Past increasing, future receding”. This is clearly the group’s most atmospheric and monumental release so far. The excursion into an ever-darker landscape that began with the critically acclaimed LP “For Flowers, Cars and Merry Wars” continues here. “Past increasing, future receding” was recorded in Emanuel Vigeland’s Mausoleum at Slemdal in Oslo: a dimly lit – almost entirely dark – barrel-vaulted room completely covered with frescos painted by Emanuel Vigeland (1875-1948). The artist himself erected the building in 1926, with a view to housing his sculptures and paintings there in the future. He later decided that the museum would also serve as his burial chamber. All the windows were bricked up, and his ashes were meant to rest in an urn above the door. Inspired by Italian influences, he named his building Tomba Emmanuelle. The impression made by the dimly lit frescos, portraying hundreds of naked figures, is heightened by exceptional acoustic properties and a long-lasting echo. This unique room has gradually become a popular concert and recording venue for artists such as Stian Westerhus, Susanne Sundfør, Diamanda Galas and Nils Økland. Even the most tentative sound evokes an enormous acoustic response in the Mausoleum. For the members of Huntsville, the overwhelming acoustics of the room became a sort of fourth member of the band while they were recording this new album. The music feels more hypnotic and visually evocative than on earlier albums, and demands the full attention of the listener. The album was the result of three intense working days with sound technician Thomas Hukkelberg. This time, too, the band mixed the album at Propeller Studio together with Kåre Chr Vestrheim (Motorpsycho, Jaga Jazzist). Recorded in an Oslo mausoleum there’s a sense of shock at play. More LP-length than CD-long the first of the three tracks, ‘Presence in Absence’, opens with what appears to be a very long note texturally assembled, held hoveringly… and then suddenly a detonation of an almost industrial nature emerging from the spaces of the Emanuel Vigeland edifice of art and echo where guitarist Ivar Grydeland, bassist Tonny Kluften and drummer Ingar Zach recorded the album and apparently felt right at home. It’s valuably-intense experimental music that banishes complacency and painstakingly creates the idea of a ‘moment’ whether it is by means of that sense of shock or the sheer intensity the trio generate. Huntsville are Scandiwegia´s answer to the Nexk, and if you´re not familiar with that Austrailan trio then what kind of avant rock connossieur are you? Huntsville´s fourth album was recorded in a very distinctive venue, Emanuel Vigeland´s mausoleum in Oslo, which was originally created in 1926 to be a museum for Vigeland´s artworks and decorated with frescoes but eventually became his lasting resting place. It is clearly a large and “highly ambient domain” which the band uses to good effect on these three poignant tracks(…)it´s intriguing and the bass is gorgeous thanks to the huge natural reverb. Sadly, by the time you get into it, your 34 minutes are up. A new Huntsville album – the trio’s second pous on Hubro and fourth overall. Past Increasing, Future Receding picks up right where For Flowers, Cars and Merry Wars had left us. The group’s sound keeps on evolving – and growing simpler. “Presence in Absence” (17 minutes, half the album’s duration) features strong plays on contrasts, a few cued hits exploding here and there along the way of an ultra-quiet track – the idea reminds me of The Necks’ “Aether.” The other two tracks propose similarly stripped-down ideas. The whole thing was recorded in a mausoleum with magnificent acoustic properties, and Grydeland, Kluften and Zach get the most out of the location. Everything on this record produces giant resonances marvelously captured by Thomas Hukkelberg. The CD is worth diving into, again and again. viktigste grunnen til at jeg setter dem høyt. Det går sakte og krever tålmodighet, men ved hver gjennomlytting oppdager man noe nytt. Trioen Huntsville utfordrer alltid. Her har de vært i Emanuel Vigelands mausoleum på Slemdal i Oslo og spilt inn musikk som på mange måter passer godt til mausoleets mørke og noe dystre atmosfære. Etterklangen i lokalet er på hele 20 sekunder, og dette brukes som et viktig element. Det er sterkt visuell musikk med mye organiske effekter hvor det både blåser, drypper og buldrer. Huntsville’s decision to record Past increasing, Future Receding at Emanuel Vigeland’s Mausoleum proved inspirational. Past increasing, Future Receding which will be released on 7th October 2013, on Hubro Music, is Huntsville’s fourth and best album. It surpasses even the critically acclaimed For Flowers, Cars and Merry Wars. That was Huntsville’s Magnus Opus. Not any more. It’s been surpassed by Past increasing, Future Receding, an innovative, inventive and atmospheric genre-melting album. Presence in Absence” eröffnet 17:01 Minuten lang. Der Titel ist Programm. Der Track fängt mit: nichts an. Unterschwellige, elektronisch anmutende Töne brechen zäh hervor – stellt die Anlage jetzt nicht lauter! Denn plötzlich wummert ein grandioser Donner in den Raum. Beim ersten Anhören durchzog mich ein jäher Schreck – und der Mordsdonner kehrt wieder! Sodann verläuft sich die Note in verspielt minimalistischen Mustern, wie eine überlichtet graue Sommerwiese, alles bunt, grell und wie tot. So klingt es wohl nur im hohen kalten Norden. Doch so sehr das Stück wie verzaubert und von anderer Welt klingt, scheinbar wie versehentlich eingespielt, so sehr hat es Magie. Die liegt nicht nur in der pulsierenden, steten Dauer, da sind mehrere Schichten. Det er første gang jeg hører Huntsville, men ikke siste. Denne skiva vil bli tatt frem i stille stunder. Wer seine CD in einem Mausoleum aufnimmt, dem schwebt vor seinem geistigen Ohr sicher etwas ganz besonderes vor. Die Gruppe „Huntsville”, bestehend aus Ivar Grydeland (Gitarren aller Art), Tonny Kluften (Bass) und Ingar Zach (Perkussion), hatte sich im Juni 2012 in das Osloer Emanuel Vigeland Mausoleum, genannt „Tomba Emmanuelle“, zurückgezogen, um ein gewagtes Werk einzuspielen. Denn anders kann man das, was bei dieser Aktion herausgekommen ist, kaum bezeichnen. In einer fast dunklen Umgebung entstand eine düstere Klanginstallation, die im Grunde zwar sehr erhaben und geheimnisvoll ist, aber immer wieder von markerschütternden Schrecksekunden und wuchtigen Sound-Kollagen unterbrochen wird. Hinzu gesellen sich seltsame Knusper­geräusche, viel präparierte Gitarre und gegen Ende sorgen dumpfe und treibende Beats für ordentlich Bewegung in der Totenstatt. Diverse elektronische Ausschmückungs­elemente umspielen Grydelands unterschiedliche Gitarren-Instrumente, Schlagzeug und Bass werden von u.a. von einem „drone commander” unterstützt, aber auch eine Tabla-Maschine kommt irgendwo zum Einsatz. Gerade mal drei Stücke beherbergt diese CD, das erste 17, die anderen beiden jeweils über 8 Minuten lang. Alles in allem ein sehr spezielles Werk, aber keineswegs uninteressant. Etwas für Klangenthusiasten halt. Time after time, the three musicians plus the space combine together to create an appealing groove that contains enough variation and detail to stay fresh and interesting over many repeated listenings. Eine schöne Platte, der ihre Schönheit und Gemächlichkeit manchmal zum Verhängnis wird. Und dennoch gut, weil man die Leere im Norden gut erahnen kann, in all ihrer Abwesenheit. Oder auch all das einfach vergessen kann. The album – just three tracks totalling 35 minutes or so, but feeling a lot more substantial than that – opens with a single monochord which gains a slow oscillation. It’s quite quiet, so go ahead, turn the volume up. And then scare the bejesus out of yourself at 1′ 25″ when a heart-stopping drumbeat sends the LEDs way into the red. From then on you know it’s going to be a dark and dangerous ride, three slowly developing pieces of music which have as much death metal (albeit quiet, restrained and all the more threatening as a result) as free-flowing industrial jazz/improv about them. For those who like the direction ex-E.S.T. members Dan Berglund and Magnus Öström are going in, this provides a more left-field experience which they might enjoy. It’s definitely music for dark nights and strong hearts. Where 2011´s For Flowers Cars And Merry Wars involved Huntsville both reinvigorating and roughly disassembling their signature motifs, this fourth album finds the Norwegian trio reforming as shadowy presences locked within crepsecular gloom. Recorded inside the nocturnal echo chamber which is Emanuel Vigeland Mausoleum in Oslo, Past Increasing Future Receding witnesses an ever-darkening incarnation of Huntsville. Cinematic and highly affecting – and, just as in the band´s live set, the occasional depth charge detonation creates and appealing sense of unease. This is the group´s fourth album, and their most monumental and assured epic to date: where The Necks meet Tortoise, Wilco, ambient Eno, Tim Hecker and In The Country. Past Increasing Future Receding” är helt väsensskild från allt Huntsville har givit ut tidigare. Om skivor som ”For Flowers, Cars and Merry Wars”, ”Eco, Arches & Eras” och ”For the Middle Class” närmast strävat efter att befria lyssnaren från spända känsloknutar, utan att egentligen vara energilösa, drar ”Past Increasing Future Receding” åt nerverna hårt. Den tidigare Huntsville-låt om ligger skivan närmast är ”Star-Spangled Swan” från split-LP:n med Splashgirl, men inte heller den kommer i närheten av musiken på ”Past Increasing Future Receding”, varken ifråga om emotionell tyngd eller musikalisk dramaturgi. Att Huntsville var kapabla till en skiva som denna trodde jag verkligen inte, men här är beviset. Om detta är en stilparentes eller början på något nytt vet jag inte, men jag hoppas definitivt på det sistnämnda. Aus nur drei Stücken setzt sich »PAST INCREASING, FUTURE RECEDING« wiederum zusammen, doch leider fehlt diesmal das gewisse Etwas, und die gute halbe Stunde Musik gewinnt nur selten Durchschlagskraft. Klanglich und atmosphärisch beeindruckt das Trio nach wie vor, doch das mäandernde Experimentieren kristallisiert sich fast nirgends zu der unvergleichlichen Dichte, die Huntsvilles bisherige Alben so stark machte. Am ehesten gelingt dies noch in der zweiten Hälfte von »The Flow of Sand«, wo irrlichternde Gitarrensplitter, beharrlich subtil variierter Rhythmus und auf- und abschwellendes Raunen und Dröhnen den Hörer gefangen nimmt. Stilistisch bewegen sich HUNTSVILLE in überwiegend ruhigen Gewässern. Der siebzehnminütige Opener “Presence In Absence” startet mit drone-ähnlichen Sounds, bis ein gewaltiger, einzelner Donnerschlag des Schlagzeugs dem Hörer einen ebenso gewaltigen Schrecken einjagt – selten war Ruhe und Stille solch ein inhaltsschwangeres Stilmittel wie vor dieser unerwarteten Eruption. Das Stück bleibt dann überwiegend ruhig und treibt in freejazzig angehauchter, aber ebensogut auch leicht postrockender Manier dahin, immer wieder aufgebrochen durch zarte Klänge, die wie vereinzelte Tropfen in einen großen See fallen und Ringe auf der Wasseroberfläche nach außen treiben lassen. FAZIT: Ein Kopfhöreralbum, zu hören mit geschlossenen Augen, ohne äußere Einflüsse, in absoluter Ruhe.